While field tests and customer reports provide valuable information for potential users, controlled testing conducted by independent, recognized authorities ensures that testing procedures are repeatable, reliable and have a high degree of accuracy. The procedures used should also adjust for variation in ambient conditions. 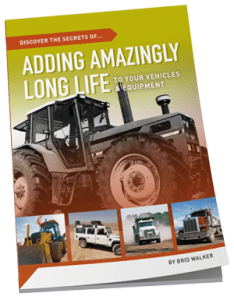 This paper investigates the claim made by numerous users of Cost Effective Maintenance (CEM) products, that their “vehicles and equipment run better than they did when new”, when using CEM products. 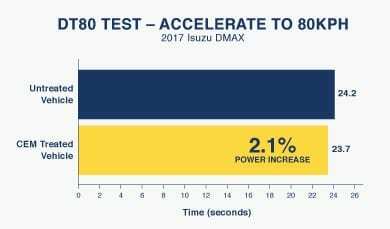 To determine if these claims are valid, and if so quantify any benefit, Cost Effective Maintenance contracted an independent, Australian government approved testing facility to conduct testing on a brand new Isuzu DMax 4×4. The Brisbane City Council is approved by the federal government to conduct the recognized test procedure for diesel vehicles, known as the DT80 Test. The primary purpose of the test is to measure diesel exhaust emissions, and in doing so, it also accurately determines fuel consumption in grams of CO2/km (which can also be directly converted to L/100km). The DT80 Test involves operating the vehicle through a cycle that simulates real life driving conditions, on a dynamometer. The authorized technician accelerates the vehicle from running in gear at idle speed, to 80kph (with foot to the floor). On reaching 80kph, the vehicle is braked, and idled again for 10 seconds, before repeating the procedure. On the third acceleration, 80kph is maintained for 60 seconds, before completing the test. Throughout the whole procedure, the dynamometer is set to simulate a load of half the maximum vehicle payload. While the vehicle is undergoing the DT80 Test, exhaust gases (NOx, CO2 and Particulate Matter) are continually sampled and analysed. The data is logged at one second intervals, including instantaneous vehicle speed. Quality Assurance testing is completed prior to each individual DT80 run. Results are corrected for variations in ambient conditions. As part of compliance with federal government approvals, the dynamometer and associated data recording equipment must be maintained in strict accordance with mandatory protocols. (Modifications and aftermarket devices are not considered here, as these can affect warranty.) Promoting a faster and more complete fuel burn, will result in release of a greater portion of the fuel’s energy being released closer to piston top dead centre, where it is more effective in producing power. In doing so, it is important not to alter the fuel specification. A diesel engine operating at around 2000rpm typically loses 25% of its power to frictional losses within the engine. Approximately half this is attributed to the piston ring and cylinder wall contact. Frictional losses in the drive train account for a further 10-15% power loss. Clearly, there is scope to improve overall efficiency where these losses can be reduced. With diesel engine fuel systems running increasingly higher fuel pressures, and multi-step fuel injections per firing cycle, precise injector response is paramount. These high pressures also produce a high fuel temperature, and combined these conditions can cause the diesel fuel to degrade within the fuel system. The result is deposit formations and loss of fuel lubricity, which can inhibit injector response. A lubricant assistant, known as AW10 Antiwear, which has been demonstrated by the Falex Test to reduce friction and wear in laboratory type conditions. A fuel system cleaner, which also increases diesel fuel lubricity, known as CRD Fuel Enhancer, has the potential to reduce fuel temperatures within high pressure diesel injection systems, and improve injector response. An engine decarbonizer and combustion catalyst, known as FTC Decarbonizer, with an established record of improving fuel efficiency in laboratory and field trials, most notably with open cut mine mobile equipment. Cost Effective Maintenance purchased a new (2017) Isuzu DMax ute fitted with a 3.0L common rail turbocharged, intercooler diesel engine. It also features the diesel particulate filter (DPF). Vehicle “running in” time was allowed prior to actual testing, and the vehicle was running with all three treatments during the run in period. This ensured that there was minimal chance of any build-up of deposits that may favour the products under test. Thus the initial series of DT80 tests was performed on 26.10.2017, with the vehicle treated with AW10 Antiwear in the engine, both diffs, gearbox and transfer case. 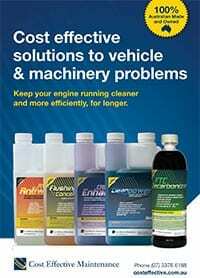 The Shell brand diesel fuel was treated with a mix of the FTC Decarbonizer and CRD Fuel Enhancer. The DT80 Test was performed four times. After the test was completed, all oils were drained and replaced with the Isuzu recommended oils, without any treatments. The DMax was subsequently fuelled with untreated fuel only, and once again presented for the untreated DT80 Test on Shell fuel. Another four runs of the DT80 Test were performed two weeks (2385km) later on 9.11.2017. 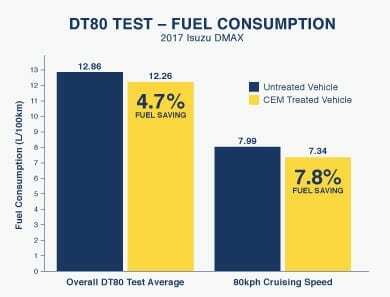 The independently conducted DT80 Test does support customer comments that their vehicles and equipment “run better than they did when new”, by confirming significant improvements in both fuel economy and acceleration. One feature of computer controlled diesel engines, is that maximum power is usually restricted, and we saw evidence of this in some components of the DT80 Test procedure. Further work is recommended across a wider range of power settings.